Fear and anxiety, whether mild or severe, is real and for many people can be a barrier to seeking dental treatment. Noisy drills, needles and numb lips can prevent people from taking a positive, proactive approach to oral health. With the Waterlaser dental laser, we can work on restoring your smile without the heat and vibration of the drill. Using a process called HydroPhotonics, the Waterlase dental laser uses laser energy, combined with a spray of water, to perform a wide range of procedures comfortably. Plus, this modern laser can be used for canker or cold sore treatment in addition to fillings and other hard and soft tissue procedures. 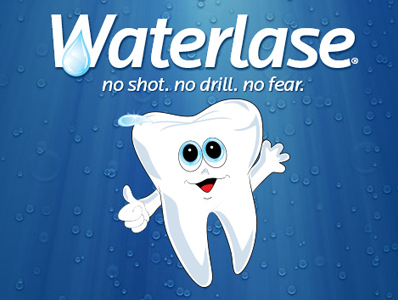 The many advantages of Waterlase over conventional drills include greater patient comfort in the chair and fewer or no shots for cavity preparation. Best of all, it's great for kids who may be fearful or have a hard time sitting still—turning their visit to the dentist into a positive experience!